Sorry... the 2017 Volvo S90 is no longer being sold as new. 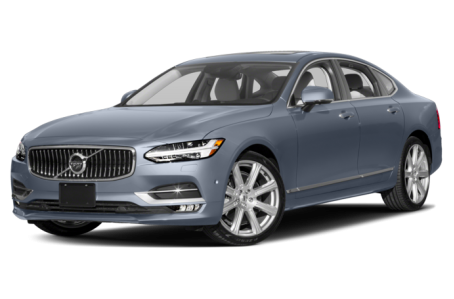 Instead, take the first step to a great deal on 2019 Volvo S90 with a free price quote! Volvo is looking to break back into the full-size luxury sedan market with its all-new S90 flagship sedan. The gas/plug-in electric hybrid will act as the successor to the outgoing S80 and will be the first Volvo car to carry the S90 name since 1998. In addition to its hybrid powertrain, the S90 distinguishes itself from competitors like the BMW 5 Series and Mercedes-Benz E-Class with a host of new safety technology including a large-animal avoidance system. While the S90's closest familial ties are to the S60 and outgoing S80, it doesn't bear much of a family resemblance to either. The S90 eschews the narrow-nosed, low-slung look of the sedan it replaces for a more nimble-looking and higher-riding posture. Straight, stark character lines along the S80's profile are replaced with the S90's gently flowing contours spanning the door panels from wheel well to wheel well. A rounded, sloping roofline creates a more gradual line from the rear to the elongated hood. The S90's face is characterized by Volvo's "Thor's hammer" LED headlights and a round-edged rectangular spindle grille, across which a large version of the automaker's bandolier emblem is slung. Inside are bolstered, perforated leather front seats separated by a large center console and vertically oriented center stack containing the multimedia screen, which is flanked by tall climate-control vents. Authentic-looking wood accents adorn the door panels, console and dashboard area. From the driver's seat, a virtual gauge display is visible through a stitched, two-tone steering wheel. The S90 is powered by Volvo's T8 Twin Engine plug-in hybrid system, which comprises a 2.0-liter gas engine and an electric propulsion system that uses a mid-mounted, high-voltage lithium-ion battery pack. The all-wheel-drive system is mated to an eight-speed automatic transmission. Volvo says the powertrain is "designed to deliver three cars experiences in one": Pure, using only electric power; Hybrid, using a combination of the gas and electric systems; and Power, for which all available oomph is summoned from all sources for maximum performance. Safety technologies on the S90 seek to perpetuate Volvo's rep as an innovator in the field of saving lives. One of these is Pilot Assist, a semi-autonomous driving feature that's a sort of hybrid of lane keep assist and adaptive cruise control, only the system requires no car to follow behind in order to function. According to the automaker, Pilot Assist "gives gentle steering inputs to keep the car properly aligned within lane markings" at speeds of up to nearly 81 mph. Another notable advanced safety feature is what Volvo calls a "world-first function" of its City Safety suite: large-animal detection. The system reportedly is capable of detecting large animals such as elk, horses or moose, offering a warning and brake assistance to help avoid a collision. 15 of 17 (88%) consumers said they would recommend this vehicle to a friend.